Certified to clean thousands of times better than most chemicals and is currently the only non-chemical based disinfectant with an EPA registered number. 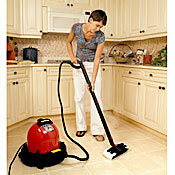 The Ladybug XL2300 TANCS steam cleaner is the standard Ladybug XL2300 and then some! For those of you who want the onboard tools, high temperature steam and more robust wiring of the standard Ladybug XL2300, but also need to achieve the absolute highest level of cleaning, the Ladybug XL2300 TANCS is as good as it gets. It is ideal for anyone who has severe allergies, asthma, a comprised immune system or has a space such as a hospital, that needs to be kept immaculately clean. While it costs more than most other steam cleaners, this unit has been lab tested and certified and is the only non-chemical disinfectant to have an EPA established number. Here is what we found when putting the Ladybug XL2300 with TANCS to the test. Effectively kills dust mites and bed bugs: the Ladybug XL2300’s versatile attachments and its high temperature steam can assist with killing dust mites and bed bugs that are living in your clothes, mattresses, carpets and upholstery. Will maintain steam pressure for a longer time compared to our Ladybug 2200S and 2150S models. Plus it is equipped with a pressure gauge which allows you to keep an eye on the boiler pressure when steaming for longer periods of time. This maximizes the users’ performance while steaming.